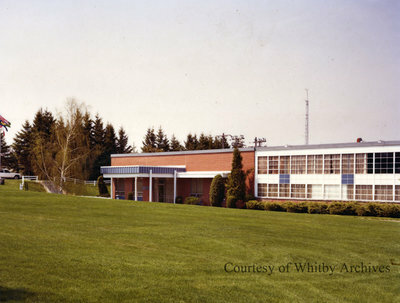 Colour photograph of the Andrew Antenna Company facility in Whitby. Andrew Antenna Company Limited, a subsidiary of Andrew Corporation of Illinois, USA, was incorporated in Canada in 1953. It occupied this building for over 30 years. Product - Manufacturer of microwave antennas & antenna systems"
Andrew Antenna Company Limited, ca. 1983, photographer unknown. Whitby Archives photograph D2016_004_012.